Interested in buying bulk quantities to re-sell? Please Contact Us for bulk quantity prices. Minimum bulk order is 10 hair shears. You also get with your purchase of hair cutting shears a free leather case. Country wide free shipping on the purchase of our hair cutting shears (Except AK, HI, PR). 30 DAY RETURN POLICY. 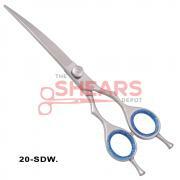 You don't like the hair cutting shears return them for a replacement or complete refund. Your choice! Description: A perfect barber scissor. Made of 420C high quality Stainless Steel. Unbelievable low price! Description: A very nice hair scissor with a safety tip. Made of 420C Stainless Steel of excellent quality. Being offered at amazing reduced price! 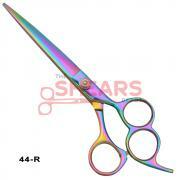 Description: A great looking hair cutting scissor with a Rainbow Finish. Available at an amazing reduced price! Description: Excellent high quality professional Barber Scissors. Have a downward curved blade. Available at amazing reduced prices! Description: Excellent quality straight blade blue titanium finish hair cutting scissors. Made of J2 420C Japan Steel. Description: Excellent quality Swagger hair scissor. Free shipping. High grade Japan Stainless Steel. Description: Excellent blue titanium finish professional hair scissor. Made of J2 420C Japan Steel in a blue titanium finish. Description: A very nice look hair scissor with 3 finger holes that provide extra stability to the stylist. Made of 420C Stainless Steel. Excellent price! Description: Excellent quality rainbow multicolor finish hair scissors. Made of J2 420C Japan Steel. Description: Excellent quality dog grooming hair scissor. Free shipping. Made of J2 420C Japan Steel. Available at a great price!!! Description: This is an excellent dog grooming scissor with a beautiful rainbow multicolor finish. Made of J2 420C Japan Steel. Available at a reduced price!! !